Building an online presence can be a fabulous way to develop an art or craft business. It's been over ten years since I started my own online business, and it has given me the freedom to work my own hours, choose projects that interest me, keep work stress to a minimum, and be available for my family. An online business opens up options for craft professionals to sell digital products as well as traditional crafts. These new options can create all kinds of promising opportunities. You can't just decide to promote your business with a website, build a site with a few pages, and be done with it. You have to do a whole lot of promotion to bring customers to your site and make the sales happen. There are plenty of fantastic ways to promote your website and sell art online. Here, we're primarily talking about Google. It's by far the most popular search engine. To get your site to show up in the top spots for Google searches, you need to be devoted to creating exceptionally good content focused on your niche. No one knows all of the secrets behind Google's search algorithm. It's a closely guarded secret. But there are plenty of well-established, valid ways to boost your site's popularity with Google. There are also practices that will hurt your site, or might work for the short term, but can come back to haunt you in the long term. There are several social media platforms you can use to promote your online craft business. That means plenty of opportunities. But it also means lots of work, and, if you use paid advertising, possibly lots of expense. It takes time to learn how to build an engaged social media following. Sifting through all of the advice can take hours. And bad advice can be hard to spot, especially if you see the same bad advice repeated by several sources. Once you learn what works, you have to create and execute a social media plan. That generally means daily, high quality posts on several sites. It's achievable, and definitely worthwhile, but if you're a solopreneur, your time is limited. You can't do all of the social media sites. You need to choose the best social media channels, based on where your customers hang out online, and make good use of those sites. If you can connect with an influencer in your niche - someone who already has a following - you may be able to get your business mentioned, and bring traffic to your own site. If an influencer is willing to showcase your work, you can reap big benefits. The trick, though, is you need to have something of value to offer that influencer. They worked long and hard to establish their following, so they aren't going to simply give it away to everyone who asks. They aren't going to lose their own readers' trust with sub-par content. It's best to reach out to related, but non-competing businesses. Look for the kind of site that would see your business as a complement to their own, not a rival. Starting out, you won't have your own following to entice partners, but if you can present your product as something of interest to their readers and provide valuable content to that influencer, then you might pique their interest. For example, the site This is Colossal frequently features spectacular and quirky crafts. I'm sure the artists featured on this popular site get fantastic sales bumps. I've seen plenty of Etsy shops with "we're behind but working as fast as we can" notices after being featured on a site like this (that's a good problem to have). What does a site like This is Colossal get out of featuring artists' work? They get fantastic content their readers enjoy, and they get affiliate income from places like Etsy. Building a mailing list for your online craft business is a fabulous, must-do strategy. Your newsletter subscriber list is made up of your most devoted customers. By giving you their email address, subscribers have told you they trust you and want to hear from you on a regular basis. You have more control over your newsletter than the other avenues we've looked at. Google could make a change, and you could lose traffic. A social media site could close (as in the case of Vine) or they could change their algorithm, so followers see fewer of your posts (hello, Facebook, I'm looking at you). But you own your business' mailing list, and you largely control what happens to your newsletter. However, before you have newsletter subscribers, you need to get people to your newsletter sign up page and make them interested enough to sign up. Generally people land on your sign up page via search engines and social media. Happily, craft professionals can also encourage customers to sign up in person, at craft shows, as well. So, a newsletter mailing list is a great way to promote your online business, and bring visitors from other sources into a format you can better control. But, for the most part, you have to get traffic to your website in order to get subscribers to your newsletter. You need a plan based on solid information from trusted sources. There are all kinds of strategies you can use to promote your site. And there are all kinds of people who will tell you how to do that - some helpful, some...not so much. When you start to really dive into researching the topic, the information can be confusing and overwhelming. Even if you know how to filter the good advice from the bad, it's hard to put it all into an organized, practical strategy to promote your online craft business. You need a plan to promote your website. Actually, you need a plan based on solid information from trusted sources. Here's where I see plenty of craft professionals' hopes for an online business fall apart. They have a gorgeous product. They are smart, excited and motivated. But they get lured into the common marketing trope that building an online business is easy and free. So they put a lot of time and effort into building a website with a "free" web building service, but they don't have a plan to promote it. What they really needed wasn't a free web building platform. They needed a plan - not a haphazard throwing together of random strategies - a clear plan with an understanding of exactly where they were going, how they were going to get there, and why. Without a clear plan, their sites, lovely as they may look, get no traffic, and bring them no business. It's a shame. I hate to see it happen because it doesn't have to be that way. Building an online business isn't easy, or free. But it is definitely reasonably affordable (compared with many other types of businesses) and it is achievable if you have the right information, and you're willing to work at it. I'm proof of that. I knew absolutely nothing about building or promoting an online business when I started this site over ten years ago. But with the right information, and a lot of work, I've turned it into a profitable business with plenty of readers, and enough income that going back to a regular day job makes no sense for me. I was immensely lucky - and then I worked hard. Back in 2006, while I was researching how to sell crafts online, I stumbled upon a product called Solo Build It. They provided the tools to build a website, but they also provided the training, and a clear, step by step strategy to build an actual business - a website that gets traffic and makes money. I did a lot of research before I bought my subscription. It was $300. Not break the bank money, but also not impulse purchase money. I'd already been burned by other companies who tried to take advantage of my new business (like the craft show promoter who tried to sell me a $3000 craft tent!!). So, I was careful and skeptical. It took me about a month of reading everything I could about Solo Build It to determine it was the real deal. 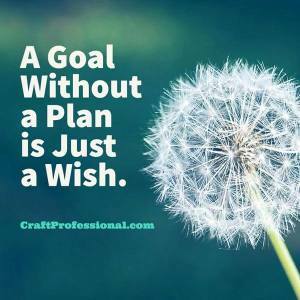 That's the secret to the success of my online business - tools, guidance, and a clear plan of action from Solo Build It - that and consistent work on my end. It's why I have thousands of subscribers to my newsletter, solid traffic coming to the site from a variety of sources, and a tidy income. 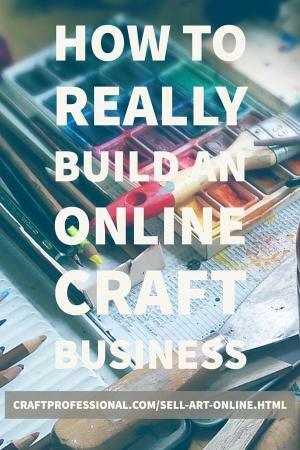 So, if you're thinking about selling your crafts online, and you're wondering where to go from here, I'd recommend checking out Solo Build It. The link here is an affiliate link. That means I get a small commission (at no cost to you) if you end up building a site there. I'd happily recommend this company to anyone who wants to build an online business even without the affiliate link. It's what I recommend to any personal friend who asks me about how to build an online business.